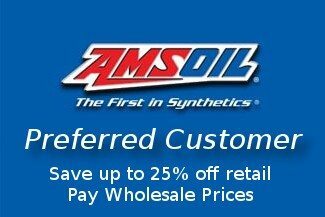 Amsoil developed an exclusive synthetic polymeric system custom-built to provide performance benefits specific to off-road equipment. This synthetic technology helps give Amsoil Off-Road Grease the ability to tenaciously stay in place and provide maximum pound-out resistance over extended service intervals, even in wet environments. Greased components in heavy equipment are subjected to serious abuse. Virtually all heavy-duty off-road equipment operates under heavy-load conditions. The extreme impact common to off-road equipment forces all of that heavy load (pressure) onto places where the equipment pivots, relying on the grease to prevent metal-to-metal contact. Lesser-quality greases cannot withstand the load and are pounded out of the impact area. When this occurs, heavily-loaded components are left unlubricated, which can result in metal-to-metal contact and extreme amounts of wear. Amsoil Off-Road Grease's exclusive synthetic polymeric technology provides exceptional adhesion (ability to cling to components) and cohesion (ability to cling to itself) properties. It is engineered to resist pound-out better than other greases in heavily-loaded, extreme-pressure applications and stay in place longer, providing outstanding lubrication over extended service intervals and reducing the detrimental effects of missed grease intervals. Amsoil Synthetic Polymeric Off-Road Grease is heavily fortified with moly for maximum wear protection to meet Caterpillar’s requirement for pin and bushing applications. Its high Timken OK load and excellent four-ball wear and four-ball weld test results are proof of its exceptional load-bearing capacity. Amsoil Synthetic Polymeric Off-Road Grease provides severe-duty performance over extended service intervals. It resists pound-out and significantly reduces the amount of grease ejected during repetitive pounding action. Amsoil Synthetic Polymeric Off-Road Grease's ability to extend service intervals and reduce grease consumption is application-dependent and operator-determined. However, field test results show that it can reduce grease consumption by up to 50 percent. That allows operators to either maintain their current maintenance schedule and use less grease per application, or extend the length of time between re-greasing intervals. Its superior pound-out resistance combined with extended service intervals and superior protection result in reduced lubricant, labor and equipment-replacement costs. Greased components on heavy equipment are frequently exposed to water. Amsoil Synthetic Polymeric Off-Road Grease resists water washout to maintain a seal on greased components and help prevent water and other contaminants from entering wear-prone areas. 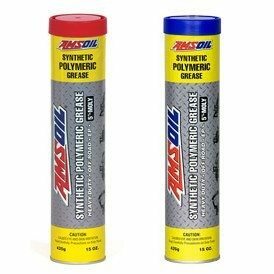 * Note: Amsoil Synthetic Polymeric Grease is designed to remain in place for long service intervals. The same properties that provide its enhanced tenacity can also make it harder to pump, particularly in cold temperatures. Amsoil GPOR2 pumps best in temperatures above 40°F; GPOR1 pumps best in temperatures above 0°F. A heavy follower plate may be necessary when pumping grease from larger package sizes. Amsoil Synthetic Polymeric Grease is not recommended for automatic or centralized lubrication systems on heavy equipment unless the system is designed to successfully pump a tackier grease. Amsoil Synthetic Polymeric Off-Road Grease is compatible with many other types of greases. However, it is recommended that when changing greases, the equipment be cleaned of the old grease when possible or flushed with a liberal amount of Off-Road Grease while the mechanism is in operation. Closely monitor the system for any inconsistencies. 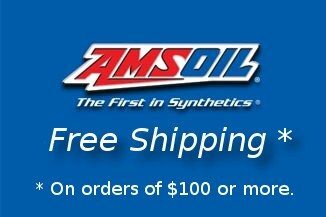 Grease compatibility questions should be referred to your Amsoil representative or Amsoil INC.